A simple and inexpensive way of adding Wi-Fi functionality to your PC. The ASUS PCE-N15 is designed to provide complete end-to-end wireless performance from the server or server backbone to the switch infrastructure and down through to the desktop with the PCI Express connector. 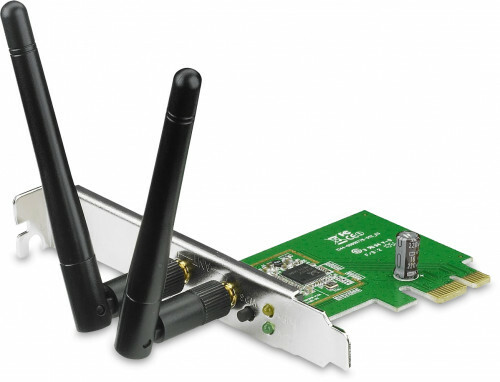 The PCE-N15 Wireless-N PCI Express Adapter provides wide compatibility, fitting with any standard PCI Express slot, x1, x2, x8, or x16. Compared with standard PCI network cards, it offers increased bandwidth, reliability and more functionality, allowing you to enjoy a fast and advanced connection, such as downloading, making internet calls and video streaming. For quickly setting up a secure wireless connection, install the utility from the Support CD, then press the hardware WPS button on the PCE-N15 and click "next". Press the hardware WPS button on the router you would like to connect to, and that's it! After the utility finishes the setup procedure, the wireless connection is done!